Moody Gardens is a unique attraction in Galveston that offers plenty of things to see and do that just about any traveler will enjoy. Part aquarium, part rainforest zoo, and part science museum, many of Moody Gardens’ attractions are contained in three beautiful glass pyramids. Walk through the Aquarium Pyramid's tunnel where sharks, fish, and other sea life swim overheard. Chatter with a monkey or one of the other hundreds of animals in the tropical Rainforest Pyramid. Interact with hands-on exhibits in the Discovery Pyramid, including the SpongeBob Subpants multimedia program; check out a 4D movie; and so much more. Step outside to experience Palm Beach, where the sand is soft, the palm trees sway, and the lagoons and waterslides mean a day of cool fun. The beautiful on-site hotel and the seaside public golf course make Moody Gardens a perfect place for a romantic getaway or a fun trip for the whole family. Hours vary seasonally and per attraction. Moody Gardens offers several ticket options. The best deals are the one-day or two-day passes, which include admission into Aquarium Pyramid, Rainforest Pyramid, MG 3D Theater, 4D Special FX Theater, Discovery Museum, Colonel Paddlewheel Boat, SpongeBob SubPants Adventure, Palm Beach (seasonal), Bands on the Sand (seasonal), Dinos Alive (seasonal), Festival of Lights (seasonal), and ICE LAND Ice Sculptures (seasonal). Visitors who purchase a day pass receive a 25% discount on Zip Line admission. 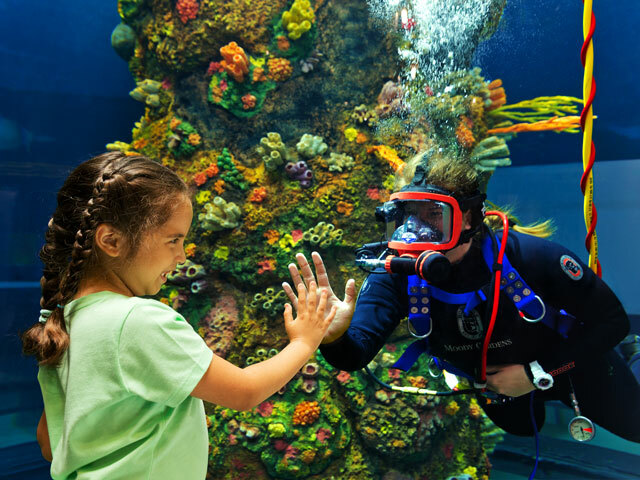 You may also purchase tickets for individual attractions at Moody Gardens. Admission prices and hours of operation are subject to change. Please check Moody Gardens' website for up-to-date information on rates and schedules before making plans.